That old saying, “when life gives you lemons, make lemonade” is a bit misleading. Lemons, although tart, aren’t considered an obstacle in my book. Heck, if life decided to give me lemons I would think I had a pretty darn good life! And although any kid will tell you that beans are the magical fruit (“Beans, beans, the magical fruit! The more you eat, the more you…”), I think lemons have much more enchanting and versatile qualities in everyday cooking. Beans are a quite delicious and wholesome addition to many sweet and savory applications, they just can’t compete with this sunny citrus fruit. Oh the sauces, tarts, cakes, curds, beverages, bars, marinades, dressings, seasonings, preserves, pastas, and candies! What would Chicken Piccata, Sole a la Meunière, and Lemon Meringue Pie be without it? They would be pretty bland, that’s what. Lemons are quite expensive up in these dreary parts, so one must utilize every last drop of precious juice and harvest all of the lovely essential oils from the zest before dropping them in the compost bin. 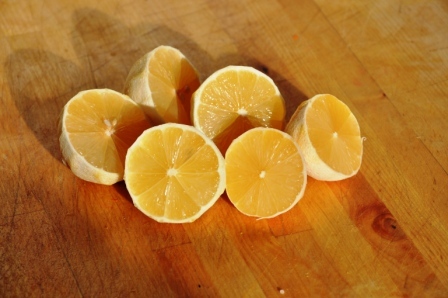 Depending on the recipe, one may need just the juice, zest, or segments of the flesh (suprêmes as the French call them). However, I always zest the entire lemon and squeeze out all the remaining juice and freeze each separately in zip-lock bags, so I can add a lemony touch to dishes at any time. It is common knowledge among professional cooks that the acid and salt in a dish must be balanced, and using lemon as the acid contributes more than just a sour bite; it can enhance the other flavors or become the star itself. Often, when a dish needs perking up, it is lacking either acidity or salinity. Conversely, if one is too pronounced, the other will tone it down. According to Sharon Hage of York Street in Dallas, “Acid is the most important aspect of how a dish tastes-whether it is there as subtle punctuation or an exclamation point!” and I couldn’t agree more. With all this yin and yang, all this magic, how could anyone by disappointed by a life full of lemons? Luckily for me, my brother handed me a big bag of lemons last week. He had stripped them of their zest for a Limoncello-style infusion he was making and offered me the remaining white, naked fruits. I happily accepted his gift and have since been brightening up my meals morning, noon, and night! 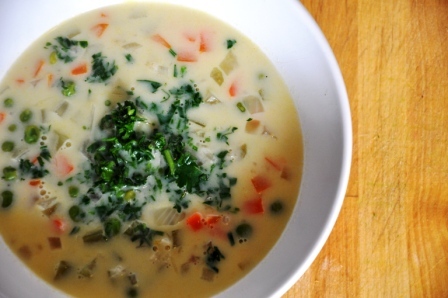 Most recently, I whipped up a batch of soup inspired by the Greek classic, Avgolemono. Tart and hearty, rich and creamy, this soup satisfies just about all the taste buds. Of course, I made it my own with the addition of extra vegetables and swapped out white rice for brown. Your family would never expect something so simple yet luxurious-tasting to be nutritious, so don’t tell ‘em! Just serve up steaming bowls of this comforting soup and wait for the praise. Oh, and p.s. if anyone doesn’t want their lemons, just send them on over to me, thank you very much! When I cook brown rice for dinner, I always make twice the amount I need. It freezes well, so the next time I want brown rice I don’t have to wait 40 minutes. I used some of that leftover brown rice in this soup. Heat the olive oil over medium heat in a medium sauce pot. 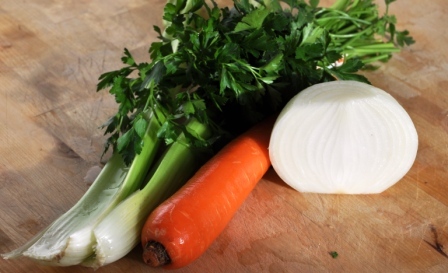 Add the onion, carrots, celery, bay leaf, and 1 tsp salt. Sweat the vegetables until their liquid has been released then fully evaporated, but don’t brown them. Add the stock and bring to a simmer. Add the cooked rice and turn the soup down to low. 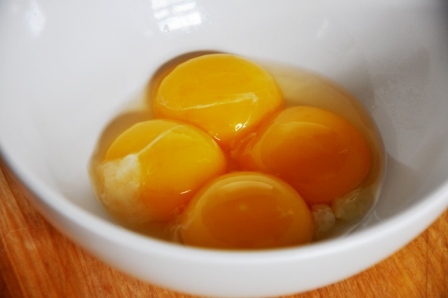 Whisk the egg yolks and lemon juice together in a small bowl. Take ½ cup of the hot soup and whisk it slowly into the egg yolk mixture. Then pour the egg yolk mixture back into the soup pot, whisking thoroughly. 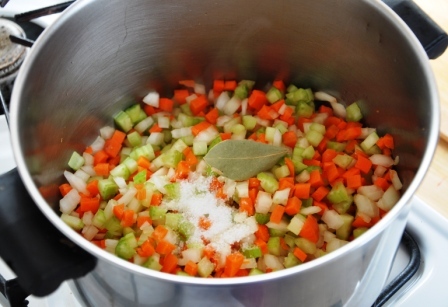 Heat the soup over low heat until steaming and slightly thickened, but do not let it boil. While you want the eggs to cook and thicken the soup you don’t want them to scramble. 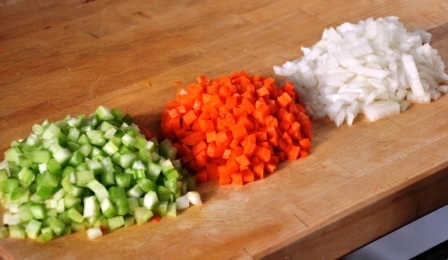 Add the nutmeg, peas or other cooked vegetables (if using) and taste the soup for seasoning. 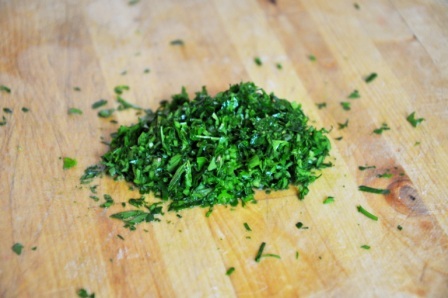 Right before serving, add the chopped parsley and serve immediately. The soup can be cooled down and stored for up to five days in the refrigerator. Remember to reheat it gently on the stove top or in the microwave, not letting it boil. That’s sounds pretty bomb! Glad to see you are making good use of those lemons!